B2B Marketing: What’s the one answer all these marketing/sales Q’s have in common? 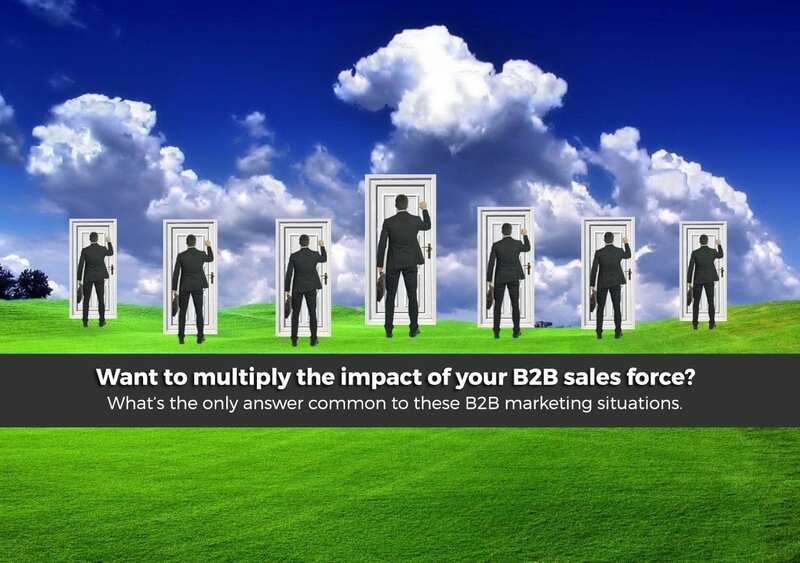 — What B2B marketing tactic is used by many in the F500 for vital targets? — What B2B marketing tactic have many Top 100 agencies used for their own marketing? — What B2B thought-leader platform does the world’s largest tech company use for its targets? — What B2B platform does a global hotel/resort brand use for its targeting group travel planners? — What B2B platform delivered a 56% inbound CTA for CIO and IT targets? — What B2B platform gave a 341% ROI for automotive manufacturer’s commercial targets? — What B2B platform does a leading carpeting brand use for its vital commercial targets? — What B2B tactic yielded a 16% purchase rate by one of world’s leading aircraft manufacturers? Yes, and the list goes on. They all use www.audienceinnovation.com platforms for key targets for CHANNEL, TRADE, C-SUITE, ENTERPRISE, RETAILERS, DEALERS, KEY CUSTOMERS, VITAL PROSPECTS, COMMERCIAL DECISION-MAKERS, etc. ??? EXTEND YOUR SALES FORCE: And yes, all of these scenarios are using our campaigns to extend the ‘arms’ of their sales force, and it’s much cheaper than adding more sales force to your company’s bottom-line. And, it augments the investment of your current sales force, while bridging-the-gap between sales and marketing. Exceptional result scenarios across all B2B-targeted categories, large or small. NEXT STEPS for CONSIDERATION: If you’d like this kind of result for your B2B targeting, please contact us as shown below. Let me know when you’d like to have a quick/casual chat about your most vital 2018 targets, or visit us online for info, case studies, and more results. We’ll deliver a campaign overview with targeting, timing, sequencing, layered options, and pricing … all in one simple document review ? nextWhy F500 Marketing & Sales Use B2B Magazine Cover Wrap Campaigns – It's simple.